Whether you simply need a routine eye exam, or you require emergency eye care services, the professional optometrists at Lickteig Family Eye Care Center are here to help. With convenient locations in Dedham, Natick, Medford ,and Boston, we serve customers all over the area, and our eye doctors bring years of experience to every patient interaction. On your first visit to Lickteig Family Eye Care Center, we’ll complete a comprehensive examination of your eyes and evaluation of your vision. We begin with an exam focused on determining the physical health of your eyes. To do this, we take advantage of a range of specialized tools including focusing lenses, a slit lamp biomicroscope, and a monocular indirect ophthalmoscope. Depending on your medical and vision history, we may use drops to dilate your eyes as well. Our comprehensive approach also includes a refraction test, which determines precisely what type of prescription you need by examining how you use your eyes. Even if your eyesight is technically 20/20, you may have issues with how well your eyes work together, and so our binocular vision testing can evaluate this to determine if there are any issues in the way your eyes focus that could impact your depth perception. 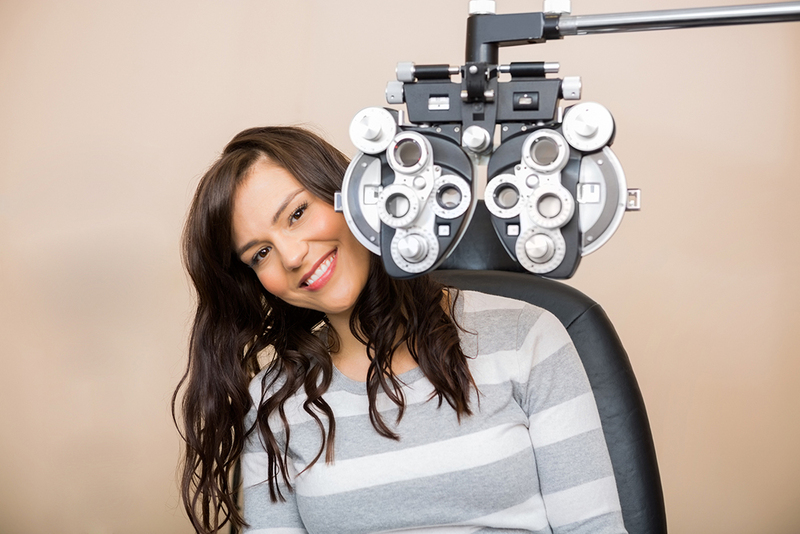 Whether you have experienced vision issues in the past or not, there are good reasons to get an eye exam regularly. Routine checkups like these can help catch degenerative problems like glaucoma or other conditions early, allowing you to begin treatment before your eyesight is noticeably impacted. This increases the chances of positive outcomes, sometimes dramatically, and it can also keep vision issues from negatively affecting your quality of life. In addition to detecting issues with your vision, routine eye care services can also catch early warning signs of other medical conditions such as diabetes and high blood pressure. Our contact lens services include fittings to ensure your lenses are both comfortable and effective. If you have an uncomplicated prescription, a sphere fit may be appropriate, and because they’re the most common, they are available in a range of wearing schedules. If you have a more complicated prescription, you may require a toric fit, and we can take care of that for you as well. These are appropriate for patients with an astigmatism, for instance, and there have been great advances in their comfort and convenience in recent years. We also provide multifocal and monovision fits, which can be particularly advantageous to our older customers who would normally have to switch to bifocals. Although children frequently receive routine eye exams in school or during regular checkups at the pediatrician’s office, these do not always detect all possible vision issues children can have. That’s why it’s still important to have your kids’ vision checked by our professional optometrists on a regular basis. We have experience dealing with children of all ages, and we make the experience as stress-free and enjoyable as possible. We also participate in the InfantSee program, which allows us to provide a complete eye exam free of charge for any child before their first birthday. Dry eye is a condition that most people will deal with in their life in some form, and the proper course of treatment depends on the underlying cause of the symptoms. Whether your eyes are burning, itching, or just generally irritated, our eye doctors will complete a thorough evaluation to determine why you’re experiencing these symptoms so that we can get you started on the proper course of treatment as quickly as possible. Some eye conditions can require surgery, and we'll help you determine if that's the right choice for you through our surgery consultation services. Some of our patients choose surgery to remove cataracts, while others are interested in learning more about LASIC or other types of refractive surgeries to correct vision issues and eliminate the need for glasses or contacts. If you do make the decision to pursue surgery, we’ll refer you to a highly-regarded surgeon in the area. • Clarifye – This advanced digital device lets us determine precisely what prescription you need with minimal time by providing our eye doctors with a more complete assessment of your eye and vision issues than was previously available. •	Retinal Photography – This technique provides an exceptionally clear picture of the blood vessels in your retina, and this is essential in assessing your eye health as well as diagnosing a number of other diseases. •	OCT – Optical Coherence Tomography (OCT) utilizes light waves to produce images of the retina from a cross-section perspective. This makes it possible for your eye doctor to examine each of the layers of the retina to get a clearer picture of where potential issues may originate. •	Visual Field – Most commonly used in the diagnosis and assessment of glaucoma, visual field testing enables your doctor to get an idea of the status of your peripheral vision. •	Topography – This computer-assisted tool allows your optometrist to view a 3D model of your cornea, and that information is essential in diagnosing and treating a number of different eye conditions. No matter where in the Boston area you’re located, our optometrists are here to serve you. Our four office locations can be found inside Lenscrafters stores in Medford, Natick, Dedham, and Boston, and we’re always eager to add new patients to our practice. So, give us a call today to learn more about the professional eye care services we offer or to schedule an appointment.